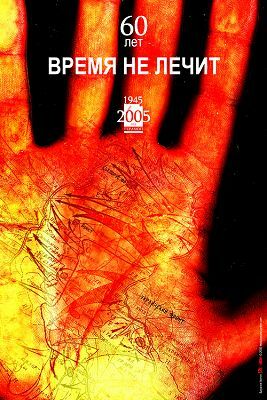 60 years - Time does not heal The Department of Graphic Design of the Belorussian State Academy of Art in Minsk (BY), and the design company Astronim have made a web exhibition of posters (in russian) for the 60th anniversary of the victory over Nazi Germany, which was widely celebrated on May 9, 2005. The idea of the project Art impact on the war www.60let.com was to bring young graphic designers into contact with a subject that has brought tremendous suffering to the people of Eastern Europe, and is particularly close to their hearts. Whether the big public noise around Victory Day is the right approach to deal with the past, and the future, is another question, and at least Andrei Logvin has voiced strong protest against it in his Blog. It needs large scale horizontal scrolling, like my Shanghai subway posters page. It also features poster voting, like my new voting pages, only more sophisticated: You can rate each of the 60 poster from "otlichno" (excellent) to "uzhasno" (terrible), and see the result immediately. The current front runner is at left.